Holy Equal-to-the-Apostles Olga was the spouse of the Kiev GreatPrince Igor. The struggle of Christianity with paganism under Igor and Olga, who reigned after Oleg (+ 912), entered into a new phase. The Church of Christ in the years following the reign of Igor (+ 945) became a remarkable spiritual and political force in the Russian realm. The preserved text of a treaty of Igor with the Greeks in the year 944 gives indication of this: it was included by the chronicler in the "Tale of Bygone Years", under the entry recording the events of the Biblical year 6453 (945). The peace treaty had to be sworn to by both the religious communities of Kiev: "Baptised Rus'", i.e. the Christian, took place in the cathedral church of the holy Prophet of God Elias (Comm. 20 July); "Unbaptised Rus'", i.e. the pagans, in turn swore their oath on their weapons in the sanctuary of Perun the Thunderer. The fact, that Christians are included in the document in the first place, indicates their significant spiritual influence in the life of Kievan Rus'. Evidently at the moment when the treaty of 944 was being drawn up at Tsar'grad (Constantinople), there were people in power in Kiev sympathetic to Christianity, who recognised the historical inevitability of conjoining Rus' into the life-creating Christian culture. To this trend possibly belonged even prince Igor himself, whose official position did not permit him personally to go over to the new faith, nor at that time of deciding the issue concerning the Baptism of the whole country with the consequent dispersal throughout it of Orthodox Church hierarchs. The treaty therefore was drawn up in the circumspect manner of expression, which would not hinder the prince to ratify it in either the form of a pagan oath, or in the form of a Christian oath. But when the Byzantine emissaries arrived in Kiev, conditions along the River Dneipr had essentially changed. A pagan opposition had clearly emerged, at the head of which stood the Varangian voevoda (military-leader) Svenel'd (or Sveinald) and his son Mstislav (Mtsisha) to whom Igor had given holdings in the Drevlyani lands. Strong also at Kiev was the influence of the Khazar Jews, who could not but be displeased with the thought of the triumph of Orthodoxy in the Russian Land. Unable to overcome the customary inertia, Igor remained a pagan and he concluded the treaty in the pagan manner – with an oath on his sword. He refused the grace of Baptism and was punished for his unbelief. A year later, in 945, rebellious pagans murdered him in the Drevlyanian land, cut down betwixt two trees. But the days of paganism and the lifestyle of the Slavic tribes basic to it were already numbered. The burden of government fell upon the widow of Igor – the Kiev Great-princess Olga, and her three year old son Svyatoslav. The name of the future enlightener of the Russian Land and of her native region is first to be met with in the "Tale of Bygone Years", – in the phrase where it speaks about the marriage of Igor: "and they brought him a wife from Pskov, by the name of Ol'ga". She belonged, so specifies the Joakimov Chronicle, to the lineage of the Izborsk princes, – one of the obscure ancient-Russian princely dynasties, of which in Rus' during the X-XI Centuries there numbered no less than twenty, but who were all displaced by the Rurikovichi or merged otherwise with them through marriage. Some of them were of local Slavic descent, others – Varangian new-comers. It is known, that the Scandinavian Viking "koenigs" (kinglets) called to become princes in the Russian cities – invariably assimilated to the Russian language, and often, they soon became genuinely Russian with Russian names and lifestyle, world-outlook and even physical appearance of attire. The spouse of Igor thus also had the Varangian name "Helga", which in the Russian "rendering" of pronunciation, is Ol'ga, Vol'ga. The feminine name Ol'ga corresponds to the masculine name "Oleg" (Helgi), which means "holy" [from Germanic "heilig" for "holy"]. Although the pagan understanding of holiness was quite different from the Christian, it also presupposed within man a particular frame of reference, of chasteness and sobriety, of mind and of insight. It reveals the spiritual significance of names, that people termed Oleg the Wise-Seer ("Veschi") and Ol'ga – the Wise ("Mudra"). Rather later traditions regard her a native of a village named Vybuta, several kilometers from Pskov up along the River Velika. They still not so long ago used to point out at the river the Ol'ga Bridge, the ancient fording place, Where Olga was met by Igor. The Pskov geographic features have preserved not a few names, connected with the memory of this great descendent of Pskov: the village of Ol'zhinets and Ol'gino Pole (Ol'ga Field); the Ol'ga Gateway – one of the branches of the River Velika; Ol'ga Hill and the Ol'ga Cross – near Lake Pskov; and the Ol'ga Stone – at the village of Vybuta. The beginning of the independent rule of Princess Olga is connected in the chronicles with the narrative about her terrible revenge on the Drevlyani, who murdered Igor. Having sworn their oaths on their swords and believing "only in their swords", the pagans were doomed by the judgement of God to also perish by the sword (Mt. 26: 52). Worshipping fire amongst the other primal elements, they found their own doom in the fire. And the Lord chose Olga to fulfill the fiery chastisement. The struggle for the unity of Rus', for the subordination to the Kievan centre of mutually divisive and hostile tribes and principalities paved the way towards the ultimate victory of Christianity in the Russian Land. For Olga, though still a pagan, the Kiev Christian Church and its Heavenly patron saint the holy Prophet of God Elias [in icons depicted upon a fiery chariot] stood as a flaming faith and prayer of a fire come down from the heavens, and her victory over the Drevlyani – despite the severe harshness of her victory, was a victory of Christian constructive powers in the Russian realm over the powers of a paganism, dark and destructive. The God-wise Olga entered into history as a great builder of the civil life and culture of Kievan Rus'. The chronicles are filled with accounts of her incessant "goings" throughout the Russian land with the aim of the well-being and improvement of the civil and domestic manner of life of her subjects. Having consolidated the inner strengthening of the might of the Kiev great-princely throne – with the consequent weakening of the influence of the jumbled hodge-podge of petty local princes in Rus', Olga centralised the whole of state rule with the help of the system of "pogosti" (administrative trade centres). In the year 946 she went with her son and retinue through the Drevlyani land, "imposing tribute and taxes", noting the villages, inns and hunting places, liable for inclusion in the Kiev great-princely holdings. The next year she went to Novgorod, establishing administrative centres along the Rivers Msta and Luga, everywhere leaving visible traces of her activity. "Her lovischa (hunting preserves) were throughout all the land, the boundary signs, her places and administrative centres, – wrote the chronicler, – and her sleighs stand at Pskov to this very day, as are her directed places for snaring of birds along the Dneipr and the Desna Rivers; and her village of Ol'zhicha stands to the present day". The "pogosti" established by Olga, as financial-administrative and law-court centres, represented sturdy props of great-princely power in these places. Being first of all, and in the actual sense of the word, centres of trade and exchange (the merchant as "guest") gathered together and became organised around the settlements (and in place of the "humanly arbitrary" gathering of tribute and taxes, there now existed uniformity and order with the "pogosti" system). Olga's "pogosti" became an important network of the ethnic and cultural unification of the Russian nation. Princess Olga exerted much effort to fortify the defensive might of the land. The cities were built up and strengthened, Vyshgorod (or Detintsa, Kroma) they enclosed with stone and oak walls (battlements), and they bristled them with ramparts and pallisades. Knowing how hostile many were to the idea of strengthening the princely power and the unification of Rus', the princess herself lived constantly "on the hill" over the Dneipr, behind the trusty battlements of Kievan Vyshgorod ("Verkhna-gorod" or "Upper-city"), surrounded by her faithful retainers. Two thirds of the gathered tribute, as the chroniclers testify, she gave over for the use of the Kiev "veche" (city-council), and the remaining one third went "to Olga, for Vyshgorod" – for the needs of building fortifications. And to the time period of Olga, historians note the establishment of the first state frontiers of Russia – to the west, with Poland. Heroic outposts to the south guarded the peaceful fields of the Kievans from the peoples of the Wild Plains. Foreigners hastened to Gardarika ("the land of cities"), as they called Rus', with merchandise and craftwares. Swedes, Danes, Germans all eagerly entered as mercenaries into the Russian army. The foreign connections of Kiev spread. This furthered the developement of construction with stone in the city, the beginnings of which was initiated under Olga. The first stone edifices of Kiev – the city palace and Olga's upper enclosure – were discovered by archaeologists only but in this century. (The palace, or more properly its foundations and remains of the walls were found in excavations during the years 1971-1972). But it was not only the strengthening of the civil realm and the improvement of domestic norms of the manner of life for people that attracted the attention of the wise princess. Even more urgent for her was the fundamental transformation of the religious life of Rus', the spiritual transfiguration of the Russian nation. Rus' had become a great power. Only two European realms could compare with it during these years in significance and might: in Eastern Europe – the ancient Byzantine empire, and in the West – the kingdom of Saxony. The experience of both empires, connected with the exaltation in spirit of Christian teaching, with the religious basis of life, showed clearly, that the way to the future greatness of Rus' lay not through military means, but first of all and primarily through spiritual conquering and attainment. Having entrusted Kiev to her teenage son Svyatoslav, and seeking grace and truth, Great-princess Olga in the Summer of 954 set off with a great fleet to Tsar'grad. This was a peaceful "expedition", combining the tasks of religious pilgrimage and diplomatic mission, but the political considerations demanded that it become simultaneously a display of the military might of Rus' on the Black Sea, which would remind the haughty "romanoi" [Byzantine Greeks] of the victorious campaigns of Askol'd and Oleg, who in the year 907 advanced in their shields "to the very gates of Tsar'grad". The result was attained. The appearance of the Russian fleet in the Bosphorus created the necessary effect for the developing of Russo-Byzantine dialogue. In turn, the southern capital struck the stern daughter of the North with its variety of beauty and grandeur of architecture, and its jumbled mixture of pagans and peoples from all over the world. But an especial impression was produced by the wealth of Christian churches and the holy things preserved in them. Tsar'grad-Constantinople, "the city of the imperial Caesar-tsar", the Byzantine Greek empire, strove in everything to be worthy for its Heavenly Mediatrix. At its very foundation (or more precisely, restoration), the city had been consecrated in the year 330 by the holy Equal-to-the-Apostles Constantine the Great (Comm. 21 May) to the MostHoly Mother of God (this event occurred in the Greek Church on the date of 11 May and from there passed over into Russian commemoration). The Russian princess was present at Divine-services in the finest churches of Constantinople – Saint Sophia, the Mother of God Blakhernae, and others. In her heart the wise Olga found the desire for holy Orthodoxy, and she made the decision to become a Christian. The sacrament of Baptism was made over her by the Constantinople Patriarch Theophylaktos (933-956), and her godfather was the emperor Constantine Porphyrigenitos (912-959). At Baptism there was entrusted to her the name Elena (Helen) in honour of the holy Equal-to-the-Apostles Helen (Comm. 21 May), the mother of Saint Constantine, and she also had been the discoverer of the Venerable Wood of the Cross of the Lord. In an edifying word spoken at the conclusion of the sacramental rite, the patriarch said: "Blessed art thou amongst Russian women, in that thou hast forsaken the darkness and hast loved the Light. The Russian people shalt bless thee in all the future generations, from thy grandson and great-grandson to thine furthermost descendants". He instructed her in the truths of the faith, the churchly rules and the rule of prayer, he explained the commands about fasting, chastity and charity. "She however, – says the Monk Nestor, – bowed her head and stood, literally like a sponge absorbing water she hearkened to the teaching, and bowing down to the Patriarch, she did say: By thine prayers, Vladyka, let me be preserved from the wiles of enemies". It is precisely thus, with a slightly bowed head, that Saint Olga is depicted on one of the frescoes of the Kiev Sophia cathedral, and likewise on a Byzantine miniature contemporary to her, in a manuscript portrait of the Chronicles of John Scilitius in the Madrid National Library. The Greek inscription, accompanying the miniature, terms Olga "Archontessa (i.e. ruler) of the Russes", "a woman, Helga by name, who came to the emperor Constantine and was baptised". The princess is depicted in special head attire, "as a newly-baptised Christian and venerable deaconess of the Russian Church". Alongside her in the same attire of the newly-baptised – is Malusha (+ 1001), the mother later on of the Equal-to-the-Apostles Saint Vladimir (Comm. 15 July). For one who had originally so disliked the Russians as did the emperor Constantine Porphyrigenitos, it was no trivial matter for him to become the godfather to the "Archontessa of Rus'". In the Russian chronicles are preserved narratives about this, how resolutely and on an equal footing Olga conversed with the emperor, amazing the Greeks by her spiritual depth and wisdom of governance, and displaying that the Russian nation was quite capable of accepting and assimilating the highest attainments of the Greek religious genius, the finest fruition of Byzantine spirituality and culture. And thus by a peaceful path Saint Olga succeeded in "taking Tsar'grad", something which no other military leader before her had ever been able to do. According to the witness of the chronicles, the emperor himself had to admit, that Olga "had given him the slip" (had outwitted him), and the popular mind, jumbling together into one the traditions about Oleg the Wise and Olga the Wise, sealed in its memory this spiritual victory in the bylina or folk-legend entitled "Concerning the Taking of Tsar'grad by Princess Olga". In his work "About the Ceremonies of the Byzantine Court" – which has survived to the present-day in but one copy, Constantine Porphyrigenitos has left us a detailed description of the ceremony surrounding the stay of Saint Olga at Constantinople. He describes a triumphant reception in the famed Magnaura palace, beneathe the singing of bronze birds and the roars of copper lions, where Olga appeared with an impressive retinue of 108 men (not counting the men of Svyatoslav's company). And there took place negotiations in the narrower confines of the chambers of the empress, and then a state dinner in the hall of Justinian. And here during the course of events, there providentially met together at one table the four "majestic ladies": the grandmother and the mother of holy Equal-to-the-Apostles Saint Vladimir (Saint Olga and her companion Malusha), and the grandmother and the mother of Saint Vladimir's future spouse Anna (the empress Helen and her daughter-in-law Theophano). Slightly more than half a century would pass, and at the Desyatin church of the MostHoly Mother of God at Kiev would stand aside each other the marble tombs of Saint Olga, Saint Vladimir and "Blessed Anna". During the time of one of these receptions, – relates Constantine Porphyrigenitos, – the Russian princess was presented a golden plate inset with jewels. Saint Olga made an offering of it at the vestry of the Sophia cathedral, where at the beginning of the XIII Century it was seen and described by the Russian diplomat Dobrynya Yadeikovich (who afterwards was to become the Novgorod archbishop Antonii): "The large golden official plate of Ol'ga of Russia, when she took it as tribute, having come to Tsar'grad; upon the plate be precious stones, and upon it is written in these stones the name Xpictoc-Christ". Moreover, the wily emperor, having reported such details as would underscore how "Olga had given him the slip", likewise presents a difficult riddle for historians of the Russian Church. The matter involves this, – that the Monk Nestor the Chronicler relates in the "Tale of Bygone Years" that the Baptism of Olga took place in the Biblical year 6463 (955 or 954), and this corresponds to the account of the Byzantine chronicles of Kedrinos. Another Russian Church writer of the XI Century, Yakov Mnikh, – in his work "Eulogy and Laudation to Vladimir... and how Vladimir's Grandmother Ol'ga was Baptised", speaks about the death of the holy princess (+ 969) and he notes, that she lived as a Christian for fifteen years, and he places the actual date of Baptism as the year 954, which likewise corresponds within several months to that indicated by Nestor. In contrast to this, describing for us the stay of Olga at Constantinople and providing the precise dates of the receptions given in her honour, Constantine Porphyrigenitos has us to understand in no uncertain terms that all this occurred in the year 957. To reconcile the cited chronicles, on the one hand, with the testimony of Constantine on the other hand, Russian Church historians are led to suppose either one of two things: either Saint Olga journeyed a second time to Constantinople in the year 957 to continue negotiations with the emperor, or that either – she was in no wise baptised at Constantinople, having previously been baptised at Kiev in 954, and that she was merely making pilgrimage to Byzantium, being already a Christian. The first supposition is the more credible. As for the immediate diplomatic outcome of the negotiations, there were basic matters for Saint Olga that had been left unsettled. She had gained success on questions concerning Russian trade within the territories of the Byzantine empire, and also the reconfirmation of the peace accord with Byzantium, concluded by Igor in the year 944. But she had not been able to sway the emperor on two issues of importance to Rus': the dynastic marriage of Svyatoslav with a Byzantine princess, and the conditions for restoring an Orthodox metropolitan to Kiev as had existed at the time of Askol'd. The evidently inadequate outcome of her mission is detected in her answer, when she had already returned home, which was given to emissaries sent out by the emperor. To the emperor's inquiry about promised military aid, Saint Olga through the emissaries curtly replied: "If thou hadst spend a time with me similarly at Pochaina, as I did at the Court, then would I give the soldiery in aid". Amidst all this, in spite of her failed attempts at establishing the Church hierarchy within Rus', Saint Olga in having become a Christian zealously devoted herself to efforts of Christian evangelisation amongst the pagans, and also church construction: "demanding the distressing of demons and the beginning of life for Christ Jesus". She erected churches: of Saint Nicholas and Saint Sophia at Kiev, of the Annunciation of the MostHoly Mother of God at Vytebsk, and of the Holy Life-Originating Trinity – at Pskov. Pskov from that period has been called in the chronicles the Domicile of the Holy Trinity. The church, built by Olga at the River Velika at a spot pointed out to her from on high, – according to the chronicler, – by a "light-beam of the Thrice-Radiant Divinity", stood for more than one and an half centuries. In the year 1137 holy Prince Vsevolod-Gabriel (+ 1138, Comm. 11 February) replaced this wooden temple with one made of stone, which in turn in 1363 was rebuilt and replaced finally with the presently existing Trinity cathedral. Another verymost important monument of Russian "Monument Theology", – a Church architecture frequently is termed, – connected with the name of Saint Olga, is the temple of Sophia Wisdom of God at Kiev, which was started soon after her return from Tsar'grad, and consecrated on 11 May 960. This day was afterwards observed in the Russian Church as a special Church feastday. In the Mesyatseslov (calendar supplement)of a parchment Epistle-book from 1307, under 11 May is written: "On this day was consecration of Saint Sophia at Kiev in the year 6460". The year-date of memory is indicated in the so-called "Antioch" rather than generally-accepted Constantinople manner of chronology, and it corresponds to the year 960 from the Birth of Christ. It was no mere co-incidence that Saint Olga received in Baptism the name of the holy Equal-to-the-Apostles Helen (Elena), who was the one to find the Venerable Wood of the Cross at Jerusalem. The foremost sacred item in the newly built Kiev Sophia temple was a piece of the Holy Cross, brought by this new Helen from Tsar'grad, and received by her in blessing from the Constantinople Patriarch. The Cross, by tradition, was hewn out from an entire piece of the Life-Creating Wood of the Lord. Upon the Cross-Wood was inscribed: "The Holy Cross for the Regeneration of the Russian Land, Received by Noble Princess Ol'ga". Saint Olga did much to eternalise the memories of the first Russian confessors of the Name of Christ: over the grave of Askol'd was erected the Nikol'sk (Nicholas) church, where according to certain accounts, she herself was afterwards interred. Over the grave of Dir – was built the afore-mentioned Sophia cathedral, which stood for half a century and burned in the year 1017. On this spot Yaroslav the Wise later on built a church of Saint Irene in 1050, but the sacred items of Olga's Sophia temple were transferred into a stone church of the same name – standing at present as the Kiev Sophia, started in 1017 and consecrated in about the year 1030. In the Prologue account of the XIII Century, it said about the Olga Cross: "for It be now at Kiev in Saint Sophia in the altar on the right side". The plundering of Kiev's holy things, which after the Mongols was continued by the Lithuanians who captured the city in 1341, did not spare even this. Under Jagiello in the period of the Liublin Unia, which in 1384 united Poland and Lithuania into one state, the Olga Cross was snatched from the Sophia cathedral and carried off by the Catholics to Liublin. Its further fate is unknown. But even in Olga's time there were at Kiev amongst the boyar-nobles and retinue-retainers no few people who, in the words of Solomon, "hated Wisdom", and also Saint Olga, for having built Wisdom's temple. Zealots of the old paganism became all the more emboldened, viewing with hope the coming of age of Svyatoslav, who decidedly spurned the urgings of his mother to accept Christianity, and even becoming angry with her over this. It was necessary to hurry with the intended matter of the Baptism of Rus'. The deceit of Byzantium, at the time not wanting to promote Christianity in Rus', played into the hands of the pagans. In search of a solution, Saint Olga turned her gaze to the west. No contradiction here yet existed. Saint Olga (+ 969) belonged still to the undivided Church (i.e. before the Great Schism of 1054), and she had scant possibility to study the theological points involved between the Greek and Latin faith-confessions. The opposition of West and East presented itself to her first of all as a political rivalry – of secondary importance in comparison with her pertinent task – the establishing of the Russian Church and the Christian enlightenment of Rus'. Under the year 959, the German chronicler named "the Continuant of Reginon", records: "to the king came emissaries of Helen, queen of the Russes, who was baptised in Constantinople, and which did seek for their nation to have bishop and priests". King Otto, the future founder of the German empire, willingly acceded to the request of Olga, but he bid the matter not be in haste, in quite German the ponderence. It was only on Nativity of the following year 960, that there was established a Russian bishop Libutius, from the monastery brethren of Saint Alban am Mainz. But he soon died (15 March 961). In his place was ordained Adalbert of Trier, whom Otto "generously furnishing all needs" dispatched, finally, to Russia. It is difficult to say, what would have happened, had the king not delayed for so long a while, but when in 962 when Adalbert showed up at Kiev, he "did not succeed in the matter for which he had been sent, and did consider his efforts to be in vain". Furthermore, on the return journey "certain of his companions were murdered, and the bishop himself escaped not mortal danger". It turned out that after the passage of years, as Olga indeed had foreseen, matters at Kiev had twisted ultimately in favour of paganism, and Rus' – having become neither Orthodox nor Catholic, had second thoughts altogether about accepting Christianity. The pagan reaction thus produced was so strong, that not only did the German missionaries suffer, but also some of the Kiev Christians who had been baptised with Olga at Tsar'grad. By order of Svyatoslav, Saint Olga's nephew Gleb was killed and some of the churches built by her were destroyed. It seems reasonable, that this transpired not without Byzantium's secret diplomacy: given the possibility of a strengthened Rus' in alliance with Otto, the Greeks would have preferred to support the pagans, with the consequent intrigues against Olga and various disorders. The collapse of the mission of Adalbert had providential significance for the future Russian Orthodox Church, escaping papal dominion. Saint Olga was obliged to accede to the humiliation and to withdraw fully into matters of personal piety, handing over the reigns of governance to her pagan-son Svyatoslav. Because of her former role, all the difficult matters were referred over to her in her wisdom of governance. When Svyatoslav absented himself from Kiev on military campaigns and wars, the governance of the realm was again entrusted to his mother. But the question about the Baptism of Rus' was for the while taken off the agenda, and this was ultimately bitter for Saint Olga, who regards the good-news of the Gospel of Christ the chief matter in her life. She meekly endured the sorrow and grief, attempting to help her son in civil and military affairs, and to guide matters with heroic intent. The victories of the Russian army were a consolation for her, particularly the destruction of an old enemy of the Russian state – the Khazar kaganate. Twice, in the years 965 and 969, the armies of Svyatoslav went through the lands of "the foolish Khazars", forever shattering the might of the Jewish rulers of Priazovia and lower Povolzhia. A subsequent powerful blow was struck at the Mahometan Volga Bulgars, and then in turn came the Danube Bulgars. Eighteen years were spent on the Danube with the Kiev military forces. Olga was alone and in worry: it was as though, absorbed by military matters in the Balkans, Svyatoslav had forgotten about Kiev. In the Spring of 969 the Pechenegs besieged Kiev: "and it was impossible to lead out the horses to water, for the Pechenegs stood at the Lybeda". The Russian army was far away, at the Danube. Having sent off messengers to her son, Saint Olga herself headed the defense of the capital. When he received the news, Svyatoslav rode quickly to Kiev, and "he hugged his mother and his children and was distressed, with what had happened with them from the Pechenegs". But after routing the nomads, the warrior prince began anew to say to his mother: "It doth not please me to sit at Kiev, for I do wish to live at Pereslavl' on the Dunaj (Danube) – since there be the centre of my lands". Svyatoslav dreamed of creating a vast Russian holding from the Danube to the Volga, which would unite all Rus', Bulgaria, Serbia, the Near Black Sea region and Priazovia (Azov region), and extend his borders to those of Tsar'grad itself. Olga the Wise understood however, that all the bravery and daring of the Russian companies could not compare against the ancient empire of the Byzantine Romanoi, and that the venture of Svyatoslav would fail. But the son would not heed the admonitions of his mother. Saint Olga thereupon said: "Thou dost behold, that I am ill. Why wishest thou to forsake me? When thou buriest me, then set out whitherso thou dost will". Her days were numbered, and her burdens and sorrows sapped her strength. On 11 July 969 Saint Olga died: "and with great lament they bewept her, her son and grandsons and all the people". The final years, amidst the triumph of paganism, for her as once haughty ruler transpired with having a priest secretly by her, so as to not evoke new outbursts of pagan fanaticism. But before death, having found anew her former firmness and resolve, she forbade them to make over her the pagan celebration of the dead, and she gave final instructions to bury her openly in accord with Orthodox ritual. Presbyter Gregory, who was with her at Constantinople in 957, fulfilled her request exactly. Saint Olga lived, died, and was buried as a Christian. "And thus having lived and well having glorified God in Trinity, Father and Son and Holy Spirit, having worshipped in the blessed faith, she did end her life in the peace of Christ Jesus, our Lord". As her prophetic testament to succeeding generations, with deep Christian humility she confessed her faith concerning her nation: "God's will be done! If God be pleased to have mercy upon my native Russian Land, then shalt they be turned in heart towards God, as for me also wast this gift". God glorified the holy toiler of Orthodoxy, the "initiator of faith" in the Russian Land, by means of miracles and incorrupt relics. Yakov Mnikh (+ 1072), an hundred years after her death, wrote in his work "Memory and Laudation to Vladimir": "God hath glorified the body of His servant Olena, and her venerable body be in the grave, incorrupt to this day". 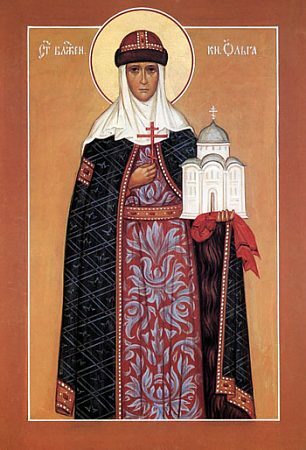 Saint Olga glorified God with good deeds in all things, and God glorified her. Under holy Prince Vladimir, ascribed by some as occurring in the year 1007, the relics of Saint Olga were transferred into the Desyatin church of the Uspenie (Dormition) of the MostHoly Mother of God and placed within a special sarcophagus, into suchlike as was customary to enclose the relics of saints in the Orthodox East. "And hear ye concerning a certain miracle about her: the grave of stone is small in the church of the Holy Mother of God, this church built by blessed Prince Vladimir, and in the grave is Blessed Ol'ga. And atop the grave was an opening wrought – for to behold the body of Blessed Ol'ga lying there whole". But not everyone was given to see this miracle of the incorrupt relics of the saint: "For whosoever with faith did come, the aperture opened up, and there was beheld the venerable body lying intact, and one would marvel at such a miracle – the body lying there for so many years without decay. Worthy of all praise be this venerable body: in the grave whole, as though sleeping at rest. But for another, who not in faith shouldst approach, the grave aperture would not open up, and they would not catch sight of this venerable body, but only the grave". Thus even after death Saint Olga espoused life eternal and resurrection, filling believers with joy and confounding non-believers. She was, in the words of the Monk Nestor the Chronicler, "a precursor in the Christian land, like the dawn before sunrise or light the twilight before the light". The holy Equal-to-the-Apostles GreatPrince Vladimir, himself giving thanks to God on the day of the Baptism of Rus', witnessed before his countrymen concerning Saint Olga with the remarkable words: "The sons of Rus' do bless thee, and also the generations of thine ultimate lineage".